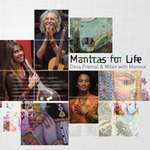 Mantras for Life CD by Deva Premal and Miten with Manose on Nepalese flute includes chants to invoke very specific intentions, among them: for animal welfare; for the blessing of children; for poetry, music and learning; for perfect timing; for physical strength, and for the earth itself. Based upon the tradition of Japan, a spiritual discipline centered upon the meditative repetition of mantra (in cycles of 108 recitations), Deva Premal and Miten invite the listener to join them in chant -- and to utilize humanity's most powerful healing tool: the voice. This transcendent collection, featuring Manose on bansuri and Kamal Engels on cello, includes chants to invoke specific intentions, including blessing of children; caring for all animals; for perfect timing; celebrating poetry, music and learning; helping friends and loved ones to transition from their physical bodies; and for offering gratitude and support to Mother Earth. Also included on the album as a bonus track is the joyful new concert favourite Ananda featuring Joby Baker. Mantras for Life was conceptually focused on supporting the listener on his or her journey into a committed meditation practice, and in its original intent had a minimalist approach to music. But, as the recording sessions unfolded, so did the musical expression. Mantras for Life testifies to the success of their experiment. Deva Premal and Miten consider themselves flame carriers of a 5,000-year-old tradition. They continue to deliver mantras in an accessible way for the growing legions of new practitioners who are adopting mantra meditation as a transformational discipline in their everyday lives.